Here is a list of data sources for investment idea. If you don’t know what to do for your investment, read here rather than roll the dice. 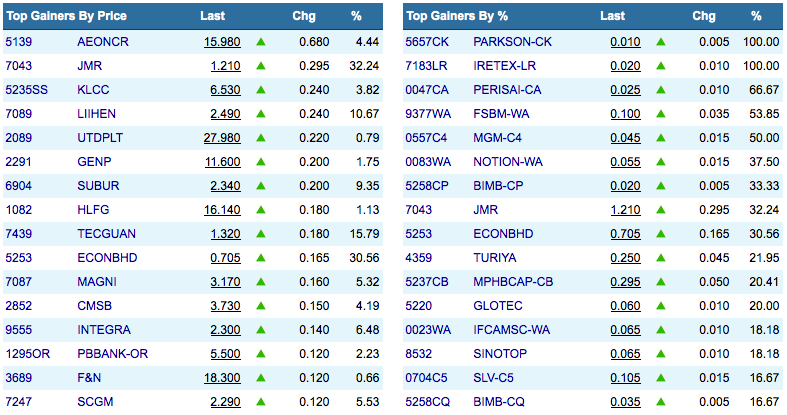 You will find here a collection of free bursa stock screeners that you can use to help your analysis. I discovered this screener just recently. I find it very visually appealing. 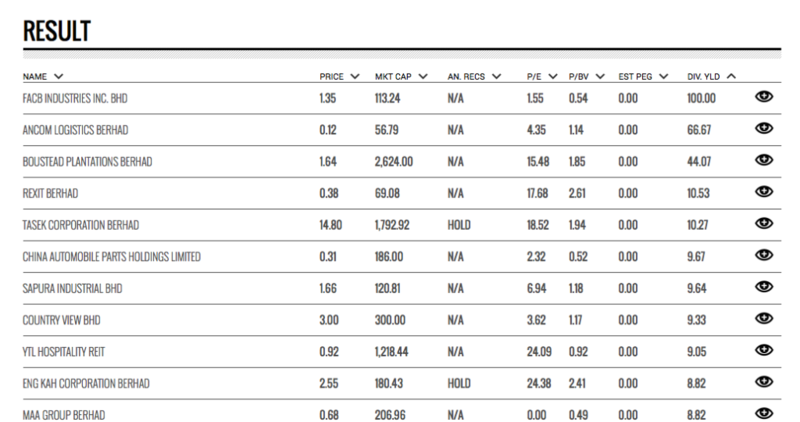 Most importantly, I found companies that pay high dividend that were out of my radar previously using this screener. 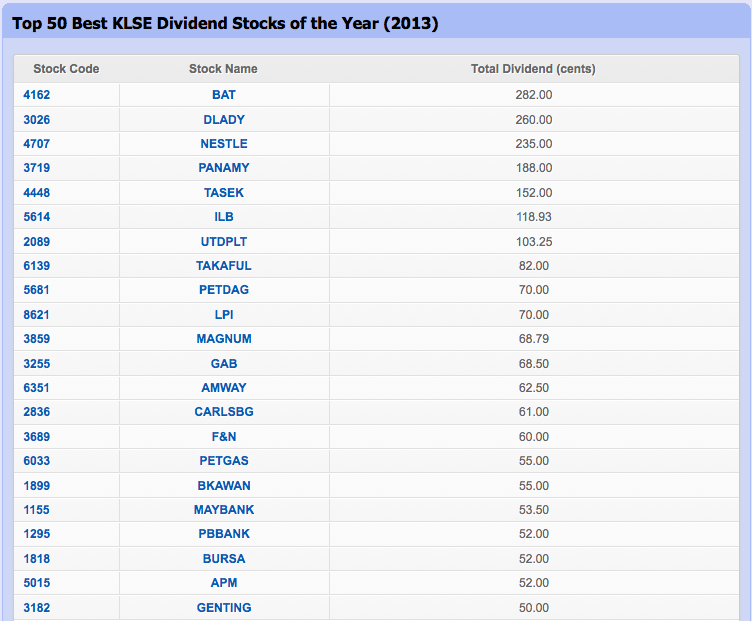 This site provides several pre-defined lists of dividend paying stocks for reference. You are unable to customize the list. However, you can still get the info you want from it. This screener not only works for local KLSE markets, it also screens stocks at foreign markets in Australia, Singapore and so on. 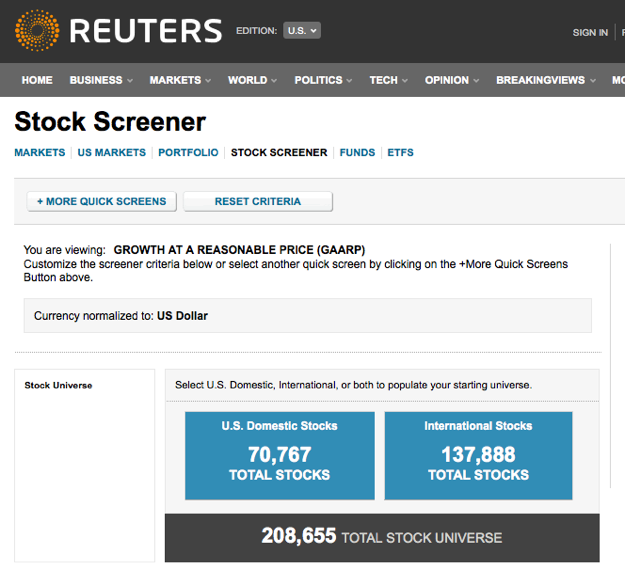 It is a global stock screener. Look for target prices provided by major banks. 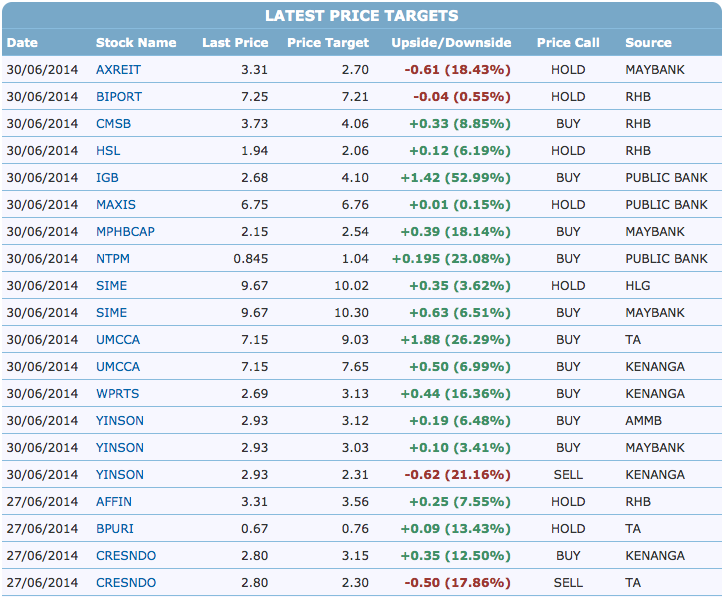 This site provides mainly technical analysis for the stocks prices. Look at the market summary. Note: Available for Hlebroking users only. This screener is very simple to use and it only provides little parameters to adjust. 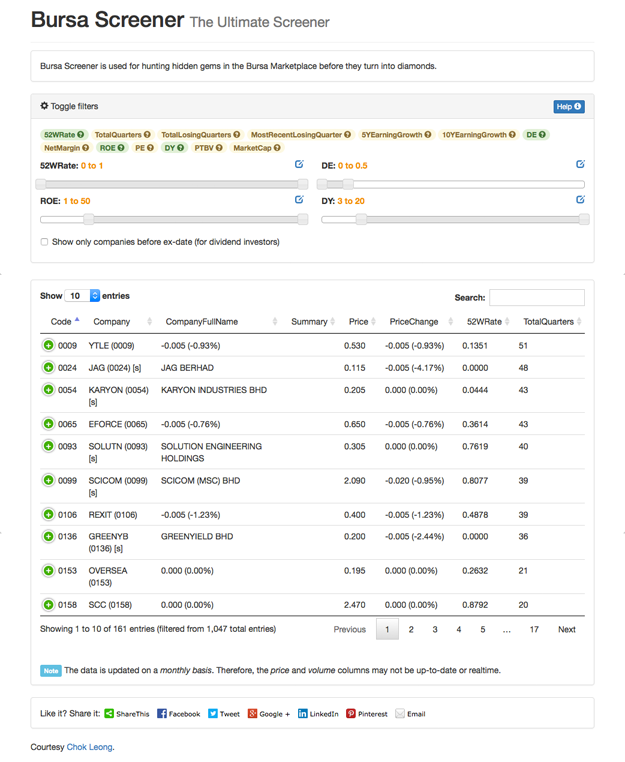 Compare companies from the same market segment. Note: Read here for examples. I use it all the time. It cost RM 70 and you can get it from Popular bookstore. 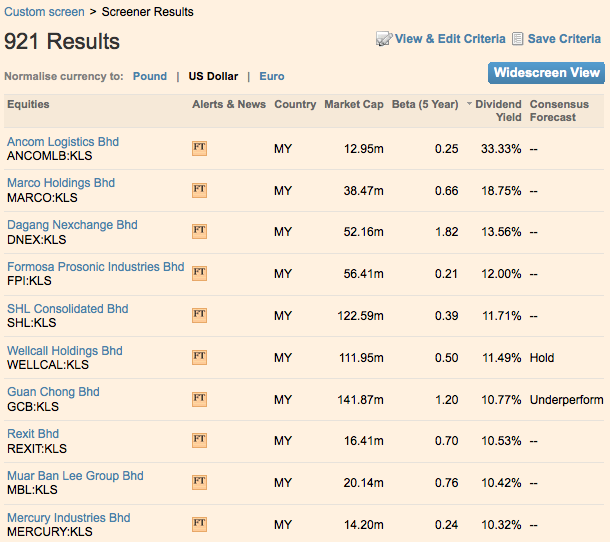 It has a universe of more than 200K stocks to screen including Malaysian market. This is my new favorite stock screener for Bursa. It includes all the hard-to-find financial ratios like DE (Debt-to-Equity), Earnings Growth, Net Margin, etc. Another screener. I discover it when trying to find stock screener for Indonesian market. 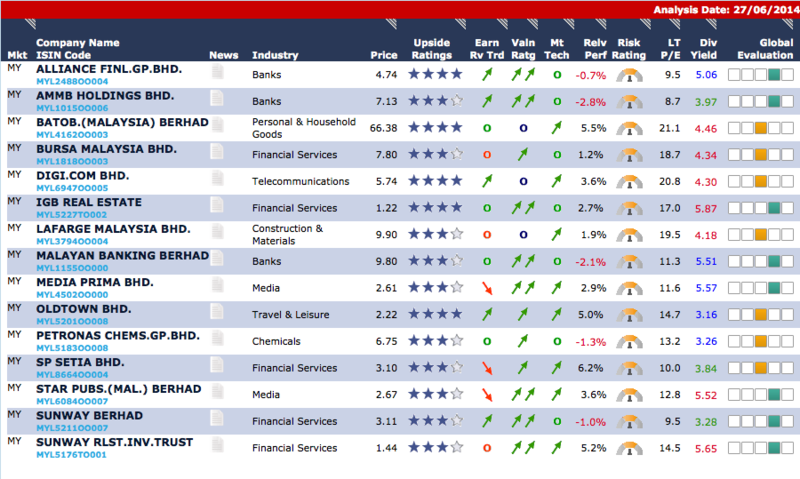 bursamalaysia.com: You can find the financial reports of all the listed companies in Malaysia from this website. Reading the financial report is the most fundamental and direct way to learn about a company. You can also get the market news from newspaper, financial magazine, etc. Forums also contain useful data that you can refer to before making any investment decisions. There are many bloggers who do lots of homework and share their finding on their blogs. Go and read blogs now! 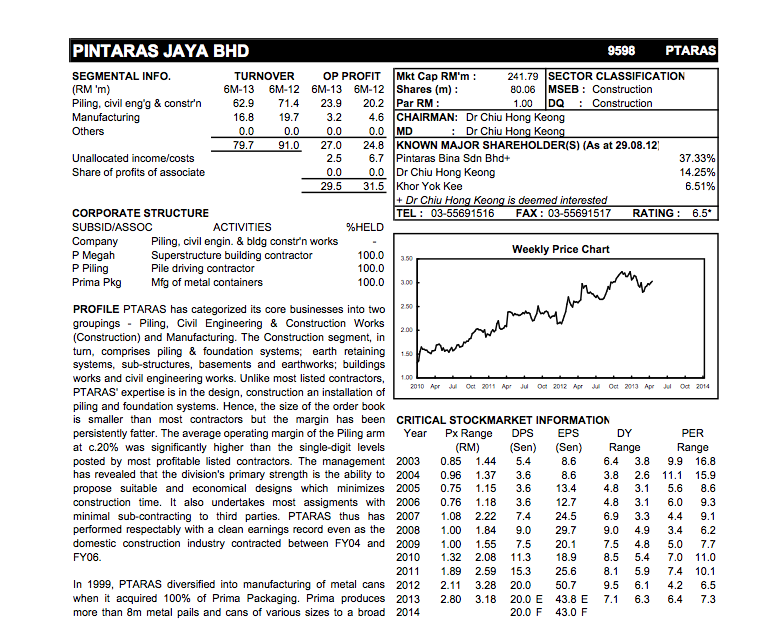 This entry was posted in Collection, Investment and tagged Finance on June 30, 2014 by Chok Leong. Household Income Has Improved By An Average Of RM1,141 Monthly says Good Stocks! Multi Management and Future Solutions Malaysia: Malaysian families had all the earmarks of being improving in 2014 contrasted with two years before that, said Khazanah Research Institute overseeing chief Datuk Charon Mokhzani. “Family unit salary has enhanced by a normal of RM1,141 month to month from 2012 to 2014. Contrasted with 2012, family units in 2014 have a higher middle of RM4,585 and a normal pay of RM6,141 contrasted with RM3,626 and RM5,000 separately. “Holes amongst urban and rustic family units, and between various ethnic gatherings are shutting with the Gini coefficient (a typical measure of imbalance) enhancing to 0.401. “In any case, abberations in riches (measured by EPF and ASB reserve funds) are more affirmed than that of pay and there is worry that numerous won’t have the capacity to sufficiently spare for retirement,” he said amid the dispatch of the Institute’s fourth production, The State of Households II today. It was noticed that development in family unit salary is not driven by extension in pay rates and wages as ostensible pay rates and wages developed at a much slower pace of 3.3 for each penny, mirroring a lower work efficiency development. It was additionally expressed that the wellspring of pay for the main 60 for each penny of family units which have turned out to be somewhat more dependent on current exchanges and also property and ventures. The middle compensation remained at RM1,600. “Malaysians are required to live more with future during childbirth is 77.4 years for ladies and 72.5 years for men in 2015 contrasted with 65.5 years and 61.6 years separately in 1970. “Longer future and declining birth rates results in Malaysia turning into a maturing country. The distribution calls for adjusting and organizing open spending between the necessities of the youthful and the old. “More ladies have additionally entered the workforce with support of 53.6 for each penny and tops at 87.7 for every penny for ladies with tertiary training,” he included. In any case, there involved profound worry that sustenance costs have ascended higher than general expansion and value irregularities were seen in imported and privately created foodstuffs, for example, vegetables, milk and chicken.